It’s hard to grow tomatoes in Colorado. But I had excellent luck this year. The best ever. I’ve been trying for 5 years, so it’s about time. Each year has gone better and better as I’ve figured out how to deal with our flaky weather. Also this year we had pretty good weather, so it was a little easier. I started way back in April, brought everything outside in May and I got my first tomato in mid-July. 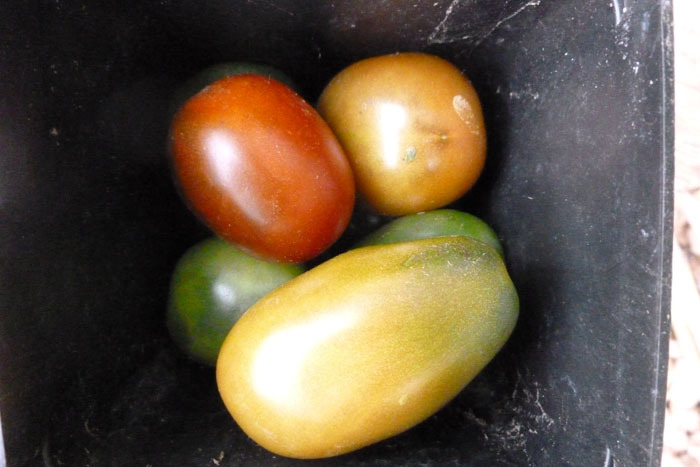 We finally dismantled the garden last week and lo and behold there were a few ripe tomatoes that had been hiding and made it thru the frost. So, technically, I got my last tomato on November 11th. I think I had about 20 tomato plants. I got hundreds of tomatoes. Rainbow Blend cherry tomatoes: These are my favorite. It’s a pack of several different colored cherry type tomatoes. They work really well in Colorado. Since they’re small, they come in quickly and they produce a lot. The rainbow blend was fun- I never knew what I was going to get. The very best tomatoes of the whole year were from this pack- I’m pretty sure they’re Green Grape! If you want to grow tomatoes in Colorado I highly recommend these. 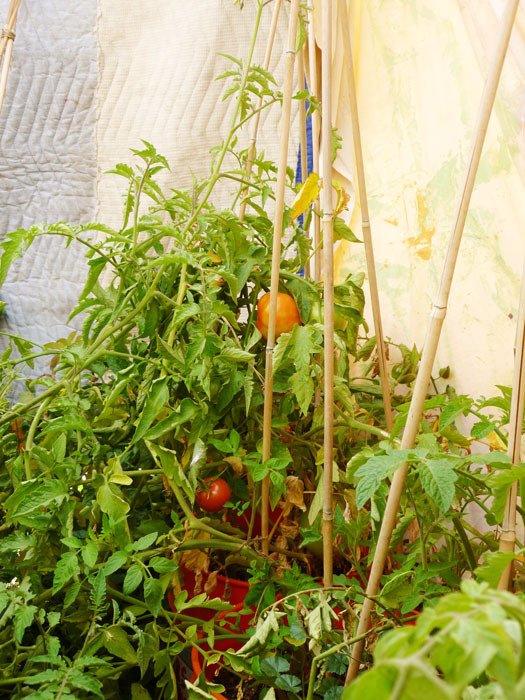 Super Sweet 100 cherry tomatoes: Another small and tasty variety- easy to grow. Siberian Red and Better Bush tomatoes: I guess these were the really plain, basic, medium sized tomatoes I kept getting. Reliable and good flavor- nothing super sublime, but a million times better than anything you’d get at the grocery store, of course. I have no idea which was which. I guess I should take better notes next time. Mr. Stripey Heirloom: These were fun and tasty. 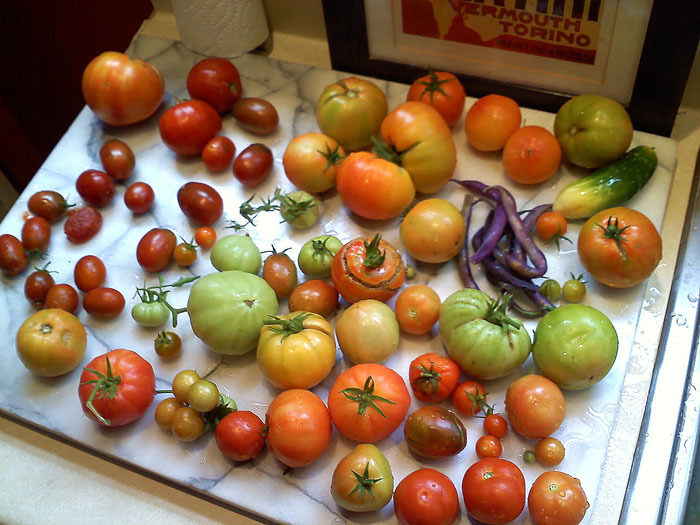 They came in really late, tho, and a bunch of them never ripened at all before the frost. They also cracked a lot. Much more than any of the others. This doesn’t really affect the flavor, but it makes them look not so pretty. 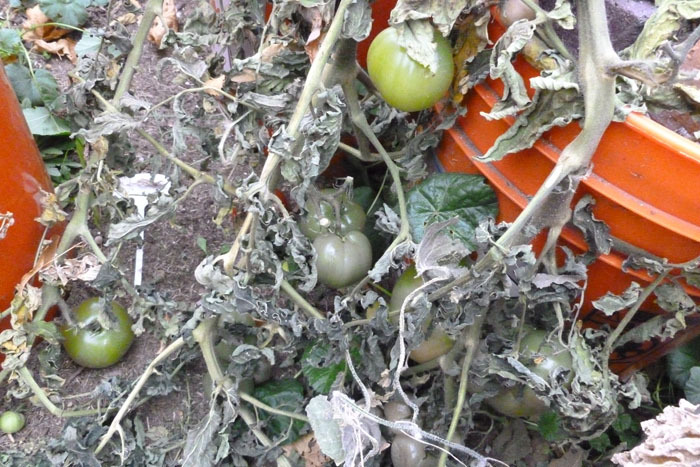 Mystery Tomato: The most prolific tomato plants I had, I have no idea the name of. I didn’t take notes about them when I planted the seeds and I don’t seem to have the seed packet anymore. I’ll research for next year, tho. They were high producers and the tomatoes were really good. You’ve seen them in almost every picture I’ve posted. I had tons of them. They’re the darker, oblong ones. 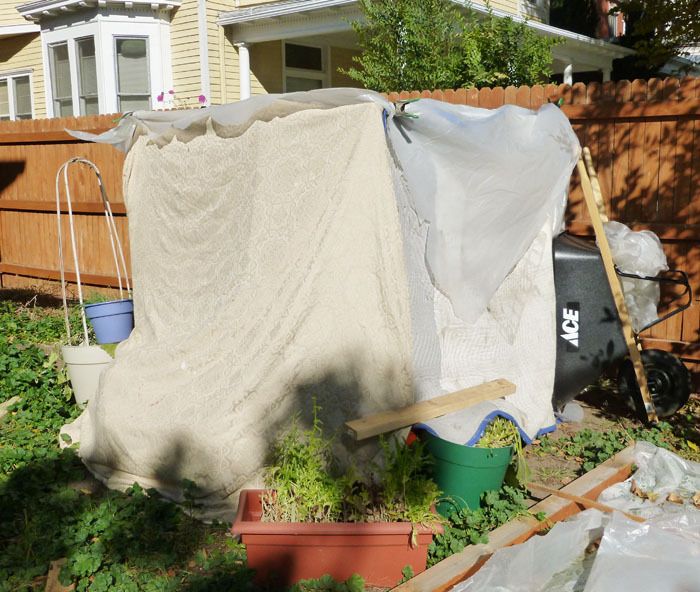 In October when it started to get cold and we had a couple of snow days, I covered the tomatoes with blankets around the shelter and plastic on top. 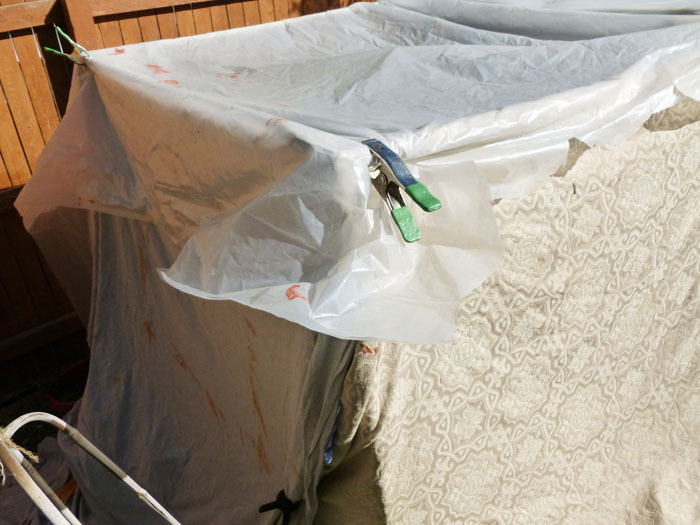 I secured it all with clamps so the wind wouldn’t disturb it. it wasn’t very pretty but it worked pretty well. It stayed really warm in there. Still, just to be on the safe side, from time to time I picked some before they were fully ripe and let them ripen in the house. I wound up doing this with eight bowls full! 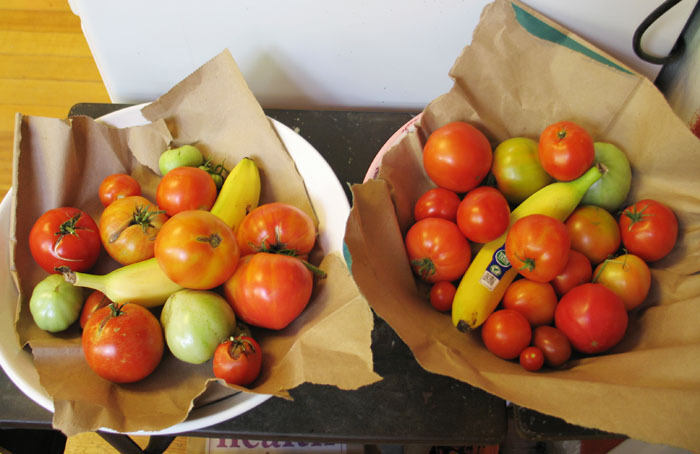 I put the tomatoes in shallow bowls with brown paper, added a banana for ethylene- the ripening gas, and covered them with more brown paper. Some of them were really good but some of them wound up tasting really weird. These little guys were hiding underneath a bunch of other plants, so they made it through the frost. I had soooooo many tomatoes this year I am hesitant to plant as many next year. But you never can tell here what’s going to happen here. I might try to start a little earlier so I can get tomatoes before July. 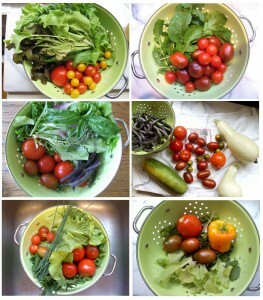 And I might not plant Mr. Stripey again since so many of them didn’t ripen before it was too late. I have a few months to think about it!